he's not in the business of cooking. "I'm just here to please people,"
have never even noticed Frank's. tired from another hard day's work. spent about three years in the Army. moved back to Greece in '73. grill, as dependable as the Acropolis. to please his patrons through his creations. "Voted the Best Tanning Salon in Ann Arbor"
Stop in Today to Check out our Summer Specials! that happen with great frequency. get the chance to experience it. Stadium, and nothing can go wrong." there's something wrong with you,"
hassle for the average football fan. rowdiness that the fans exude. Fors, and. in the country. t of what be that special. Valid with Con. $n 1 co-..nv anolies. I IValid for New Clients. 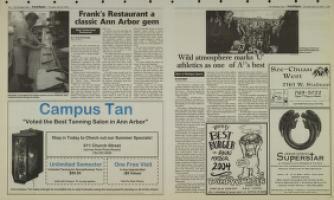 Visit Campus Tan today and get an incredible tan in only 8 minutes using the most powerful standup in all of Ann Arbor!